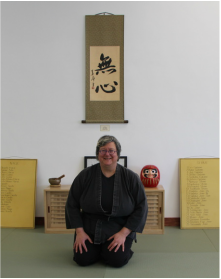 Lisa Hirsch has practiced Dan Zan Ryu jujitsu since 1982. She started her practice under Mady Shumofsky at The Dojo, and continued there under Elise Prowse. When The Dojo closed, Lisa became one of the founders of Laurel Jujitsu, practicing under Nancy and Matt Bigham and then JoAnn Strang. She owes a great debt to the late Professor Pat Browne and to the late Professor Betty (BJ) Maillette, who started The Dojo. Her current senseis are Nancy and Matt Bigham, who teach in Santa Clara, CA. Sensei Lisa teaches with kindness, humor, and respect. She believes that learning is a collaborative activity in which instructor and student work together for the student's advancement.She works to find the approach that works best for each student's strengths. Open Door Jujitsu was founded in 2012 under the name Berkeley Dan Zan Ryu. We've been Open Door Jujitsu since April, 2014. We teach Dan Zan Ryu jujitsu, a traditional Japanese martial art founded in the 1920s by Master Henry Seishiro Okazaki. We follow the teaching and kata manual of the American Judo & Jujitsu Federation. Our students can test for Dan (black belt) rank in the AJJF. Sensei Lisa Hirsch trained in the Ray Law lineage. Born in Japan, Master Henry Seishiro Okazaki emigrated to the Hawaiian Islands as a teenager. Stricken with a lung disease, he began studying martial arts and attributed his recovery and survival to his martial arts practice. Unlike most Asian martial arts teachers in Hawaii at that time, Master Okazaki was willing to teach both non-Asian people and women; photos of his student bodies include European-Americans and women. In the late 1920s, he published The Science of Self-Defense for Women and Girls, which remains in print today. Okazaki was also an outstanding practitioner of healing arts, and the AJJF teaches a class in his restorative massage technique.